The last post about risk to Delta smelt was on January 9. Adult smelt migrate into the Delta from the Bay in winter to spawn. They take advantage of the flood tide to move upstream. 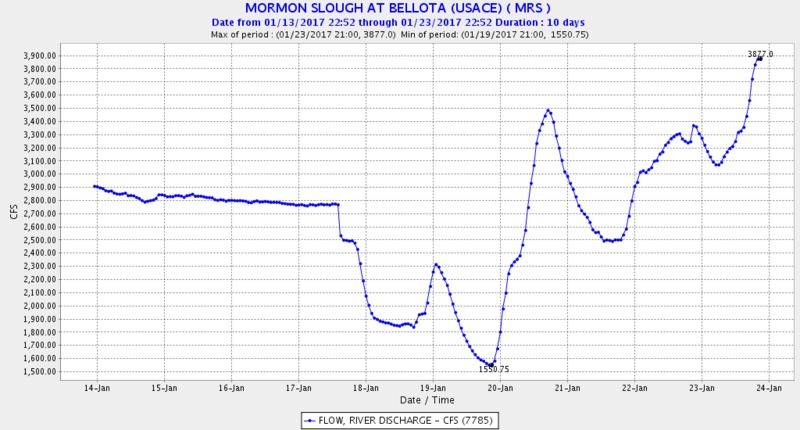 However, with flood flows as high as 100,000 cfs entering the north Delta from the Sacramento River, the Yolo Bypass, and Georgiana Slough in mid- to late January 2017, there are no flood tides to ride into the north Delta spawning areas. The only option for the adult smelt is thus to ride the incoming tide up the San Joaquin River into the central and south Delta (Figure 1). South Delta export pumping is currently at 14,000 cfs, near maximum capacity, using four rarely used auxiliary pumps. This pumping increases the pull of the incoming tide, reducing the effect of the inflow from the San Joaquin, Calaveras, Mokelumne, and Cosumnes rivers. While Delta inflow from these rivers is relatively high (Figures 2-5), it does not offset the influence of the incoming tide as does the inflow from the Sacramento. 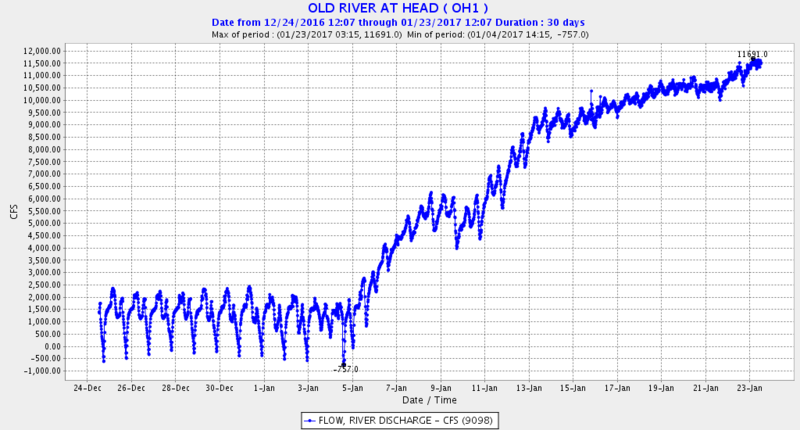 Net tidal flows in lower Old and Middle Rivers (OMR flows) remain at the allowed limit of -5000 cfs, consistent with the smelt Biological Opinion. Several adult Delta smelt were salvaged at the export facilities in mid-January. 1 This scenario is considered a “high risk” to Delta smelt by the Smelt Working Group, because of the continuing risk that the pumps will draw or attract adult smelt into the central Delta and subsequently into the south Delta. 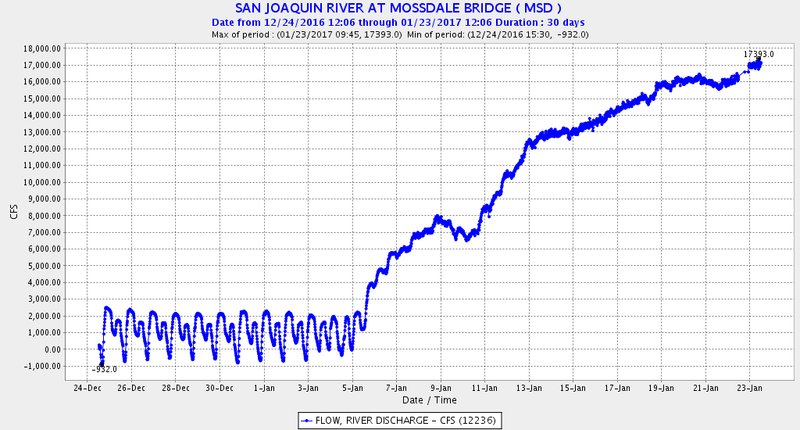 Under lower San Joaquin River flows, the maximum allowed export pumping is 11,400 cfs. 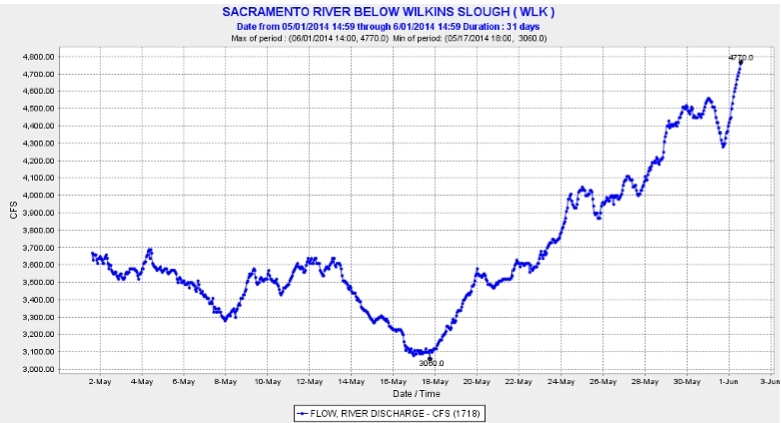 High San Joaquin River inflow allows exports of 14,000 cfs that do not generate OMR flows more negative than -5000 cfs. The theoretical benefit of high San Joaquin River flows is that it should keep flow into the central and south Delta moving westward. 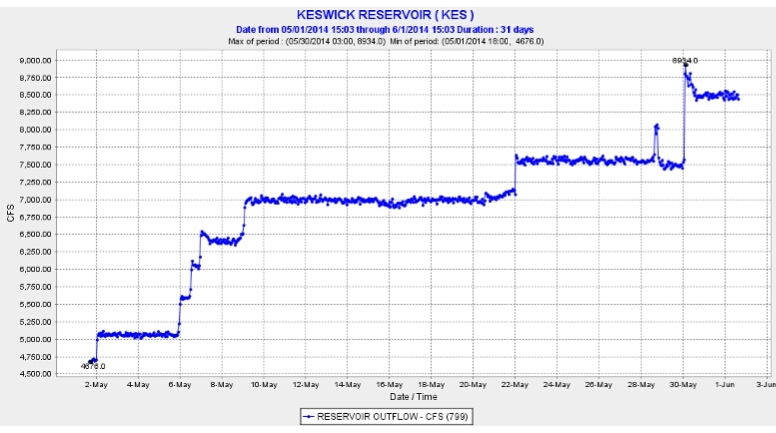 But a large portion of that inflow is diverted south into the Head of Old River toward the pumping plants (Figure 6). Figure 1. Approximate flood tide flow in cubic feet per second in mid to late January 2017. Blue arrows represent high Sacramento River, San Joaquin River and Mokelumne River flows (during flood tides). Red arrows depict negative flows of incoming tides. Note the south Delta incoming tide of -20,000 cfs would be less if not for the 14,000 cfs export rate at the south Delta pumping plants. Figure 2. San Joaquin River flow at Mossdale at the head of the Delta upstream of Stockton and the Head of Old River. 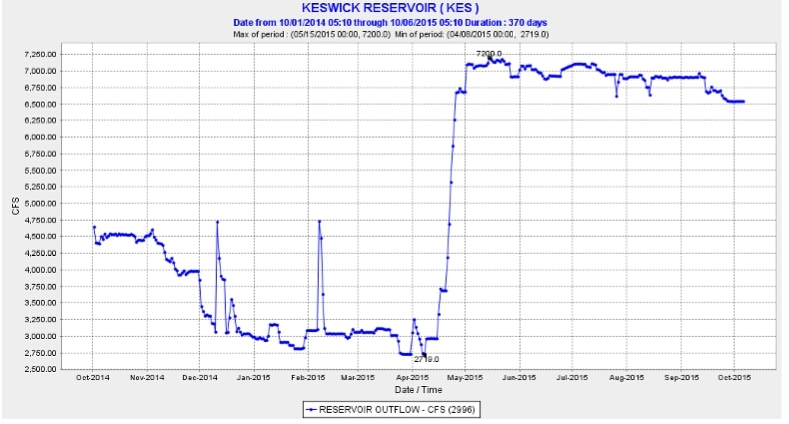 Note that on Jan 6 when flow reached about 6,000 cfs, the tidal signal dissipated when flow overcame the tidal forces. Figure 3: Flow from the Calaveras River, upstream of the Delta. The Calaveras enters the Delta at Stockton. Figure 4. 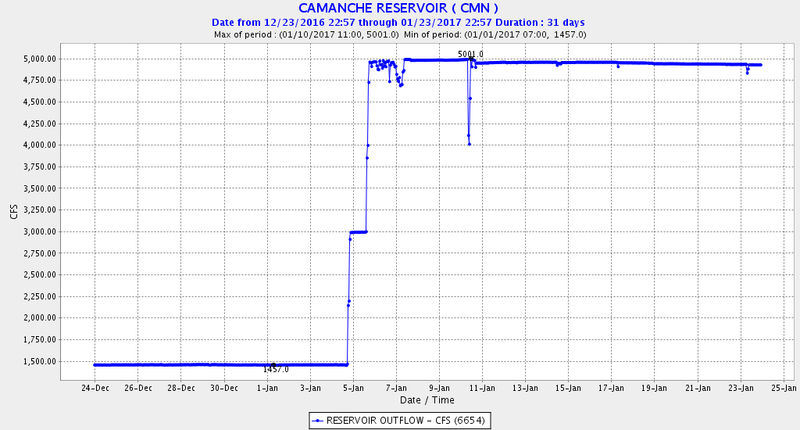 Release from Camanche Dam to the Mokelumne River. 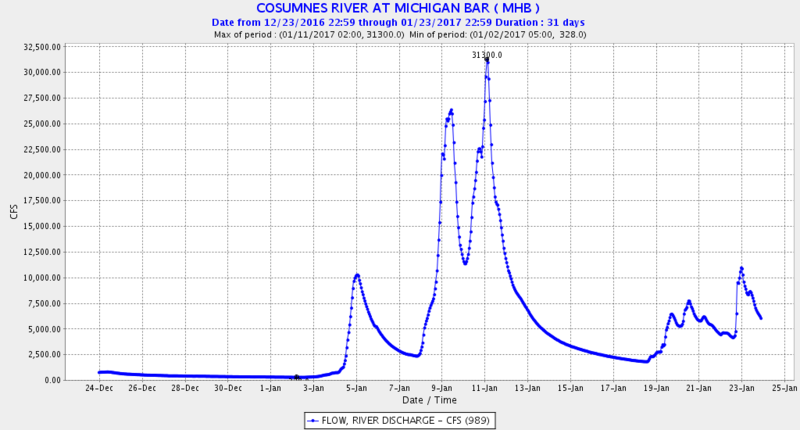 CDEC does not show flow values for the Mokelumne at gages further downstream. The Mokelumne enters the Delta near Jersey Point. Figure 6. Flow entering the entrance to Old River from the San Joaquin River near Stockton. What Caused the Impending Extinction of Delta Smelt? In his presentation, Tom put forth the hypothesis that the cause of the probable extinction of Delta smelt was the commencement of operation of the State Water Project’s Banks Pumping Plant in the mid-1970s. When Banks came on line, South Delta exports tripled, going from 2 million acre-feet to 6 million acre-feet per year. Tom’s hypothesis is that the mechanism of likely extinction was entrainment of Delta Smelt into the inflow to State and Federal South Delta pumping plants: exports. The presentation’s first slide shows the familiar long-term Fall Midwater Trawl Index (Figure 1). Tom emphasized the sharp drop in the Index in 1981 (red circle in Figure 1), the first dry year of operations under the 1978 Delta Plan (water quality standards limiting operations of the Delta pumping plants). He noted that the decline likely started in the mid-1970s, but was most severe in 1981. There were recovery periods in the non-drought years of the 1990’s and 2010-2011. However, in 2001-2005, smelt and other Delta species crashed, a period now known as the “Pelagic Organism Decline,” or POD. Following a mild recovery in the wet year 2011, Delta smelt collapsed to record low indices in 2014 and 2015 (indices of 9 and 7, respectively, not shown in Figure 1). 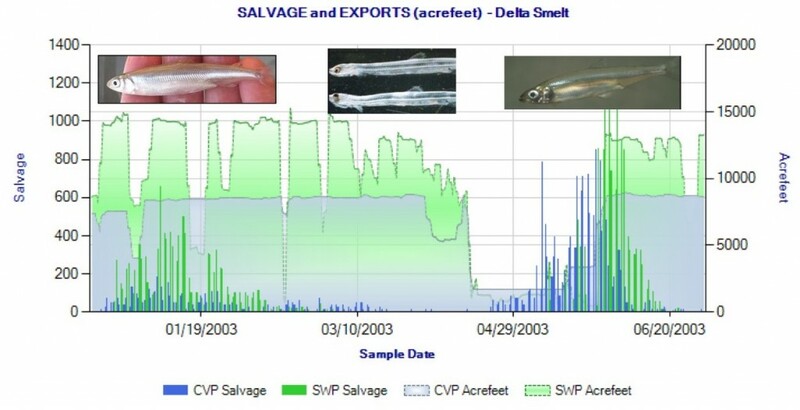 Other slides depict (1) the huge losses of adult smelt as indexed by January1 salvage numbers in 1981 (Figure 2), and (2) the salvage counts of juvenile Delta smelt in spring 1981 (Figure 3). The total salvage for January 1981 alone was over 10,000 adult Delta smelt, which compares to a total of 56 in January 2015 and 12 in January 2016. The total juvenile Delta smelt salvage in spring 1981 exceeded 100,000; in 2015, it was 4. An example of salvage during the 2001-2005 POD is winter-spring salvage in 2003 (Figure 4). Tom attributes the POD decline to the tens of thousands of Delta smelt lost to entrainment in winter and spring, including a likely large number of non-detected larvae under conditions of maximum exports. According to Tom, export entrainment is the primary causal factor for the death spiral of Delta smelt, not low outflow. 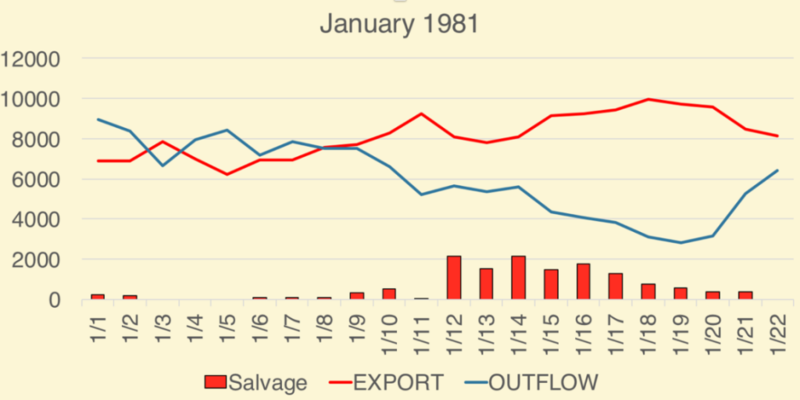 There were relatively high or improved smelt abundance indices in 1972, 1990, and 1991 (see Figure 1), which were all years with low outflows but also low exports. This is not to say, however, that low outflows are not also factors that contribute to high entrainment (Figures 2 and 3). Tom concludes that Delta smelt are virtually extinct because their adult spawning numbers are insufficient to provide recovery even under 2016’s good (wet) conditions. Adult numbers are simply too low to produce sufficient offspring (Figure 5). The proof will come this spring, summer, and fall when indices of Delta smelt juveniles will likely remain critically low and not reach 2010 or 2011 levels, the last years when habitat conditions were favorable. Figure 4. Winter-spring salvage of Delta smelt at south Delta export pumps in 2003. Delta smelt young begin reaching salvageable size (>20 mm) in early May. Also shown is export rate (acre-feet per day) by pumping plant. The maximum allowed export rate is 11,400 cfs (about 23,000 acre-feet per day). (Data Source: CDFW). Winter salvage is primarily adult smelt. Spring salvage is predominantly juvenile smelt (>20 mm). April entrainment of 5-15 mm larval smelt is not accounted for at salvage facilities, because they pass undetected through salvage screens. Figure 5. 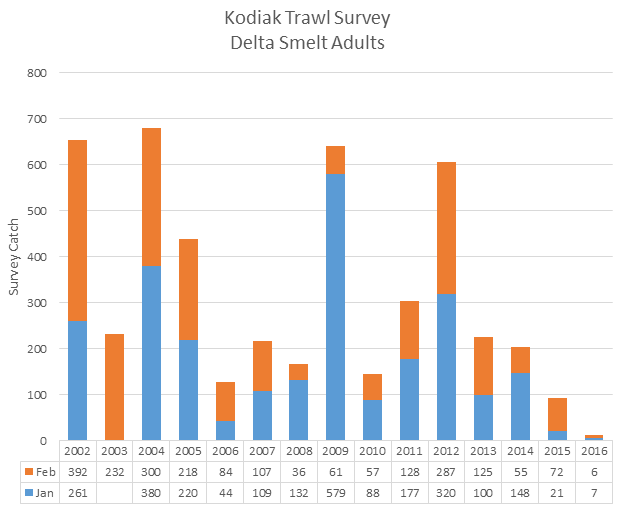 Index of adult Delta smelt spawner abundance from winter Kodiak Trawl Survey 2002-2016. After 50 years of extensive research and adaptive management, the Delta water managers still believe we need the insights of outsiders before the secrets of the Delta are exposed to improve water management for fish. Once the center of world-wide estuarine science beginning in the 60’s and 70’s, the San Francisco Bay Delta now has new advice sought from outside sources. I came to the Bay-Delta in the late 70’s as an outsider to learn from and participate in comprehensive fish-ecosystem science going on in the Bay-Delta. I was honored to participate in and contribute to Bay-Delta science. Many of the young scientists who came with me then and since have contributed decades of their careers to Bay-Delta science. Yet there is this continuing quest for more outside input fraught with non-fish science. “The economic, ecological, and social costs of scientific uncertainty in water management controversies are significant – and to some degree unavoidable. 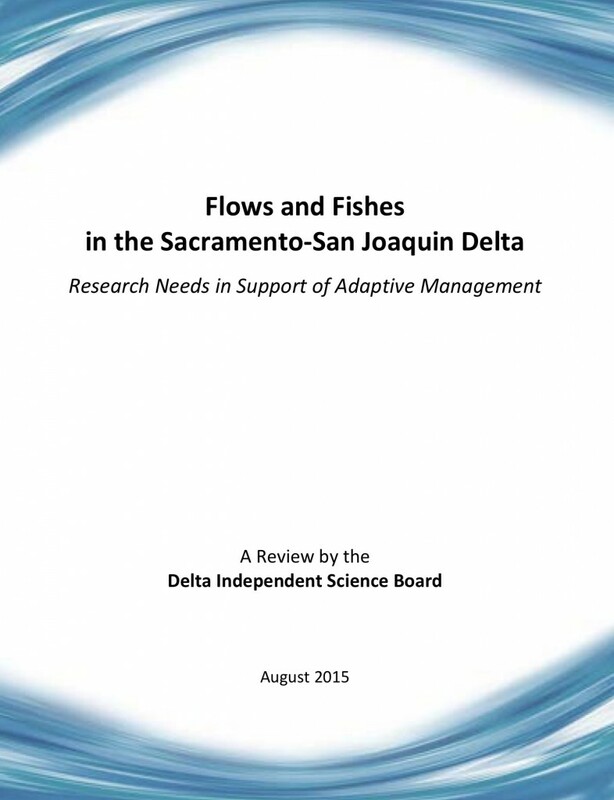 This report therefore recommends, first and foremost redoubling effects to identify causes and effects concerning fishes and flows in the Delta.” (Page 5). Uncertainty is not the cause of the failure in protecting the Bay-Delta ecosystem. It is a failure to use science with its uncertainties to protect the ecosystem. After 40-plus years of study, the answers are obvious. Redoubling? Why not simply recognizing the obvious? There are no doubts that changes in flows are the cause of most of the Delta problems, and that changes designed to reduce entrainment of fish at the Delta export pumps (OMR, etc.) have proven ineffective. There is no need to redouble efforts to understand the relationship between flows and fish. We know why the Winter Run salmon were wiped out below Shasta in 2014 and 2015. We know why Delta and Longfin Smelt populations have been at record lows the past two years. “The habitat and flow needs of the native species are difficult to define in the transformed place and in a novel ecosystem.” (Page 5). The habitat and flow needs are well known. The ecosystem, though “transformed,” is not novel. Anyone who has been here awhile and studied the fish knows. “Focus on cause and effect – the mechanisms that enable flows to affect fishes. Deeper causal understanding is important for identifying and reducing risks to water supply and fish populations.” (Page 5). We’ve been through this time after time. Overwhelmingly, finding the political will to follow the science we already have is far more critical than fine-tuning the mechanistic understanding of how fish respond to flow. The problem in the Delta is systemic: water management has turned the hydrograph on its head and deprived the estuary of half of its flow (in dry year sequences, more than half). 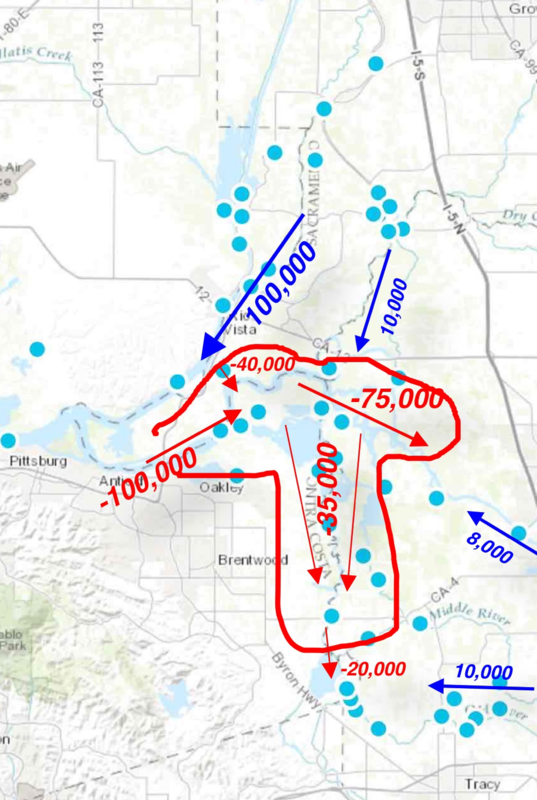 The State Water Board’s 2010 Delta Flow Criteria Report 2 got this fundamentally right: on a mass and systemic basis, Delta inflow and outflow need to be radically increased to provide basic system functions, including variability. Not every effect is a direct effect. Focusing only on direct effects – the “causal mechanisms” – is overwhelmingly about “risks to water supply.” Beneath the surface of hunting for mechanisms is an engineering-style belief that one can surgically provide water to produce this or that benefit at the exact moment it’s needed. Sure, better understanding is good, and different specific actions can help. But the need isn’t met by adding up specific actions. We need to restore underlying ecosystem function that serves as a foundation for targeted improvements. Right now we aren’t even close. “Understanding the dependencies of fishes on water flows is central to understanding the Delta ecosystem. Relationships between fishes and flows drive state and federal policy and related regulatory and management decisions, and consequently have been central to legal arguments and decisions.” (Page 9). Delta water quality control plans, and water rights orders since the 1960s (mainly D-1485 and D-1641), have recognized (and focused) on the relationship between flows and fishes. Earlier, the focus was on striped bass and flows (D-1485), but more recently the focus has been on smelt-salmon and flows (D-1641). There have been changes in summer standards that hurt striped bass while strengthening winter-spring standards have helped smelt and salmon. But after decades of management under the standards and an array of biological opinions, it is obvious to most that the level of protections has been inadequate. The problem is not a lack of science and understanding; it is a lack of commitment to them. “A comprehensive, integrative, and well-planned scientific approach focused on processes, drivers, and predictions is needed to aid near-term and long-term adaptive management and to predict how future changes might affect fishes.” (Page 21). The Bay-Delta has had this for 50 years. The science, data, and adaptive management are well documented, as well as reflected in water rights, water quality standards, biological opinions, and management and recovery plans. But most important of all, they are carried in the minds of hundreds of Bay-Delta scientists who have dedicated their careers to this purpose. “The development of a generalized fish model portable for different fish species and for different water management decisions is needed to forecast expected consequences and timelines for adaptive management strategies.” (Page 23). Such models already exist in many forms that reflect and carry the knowledge of what has been learned over the past 50 years. Models developed in the 60’s for striped bass still work today. 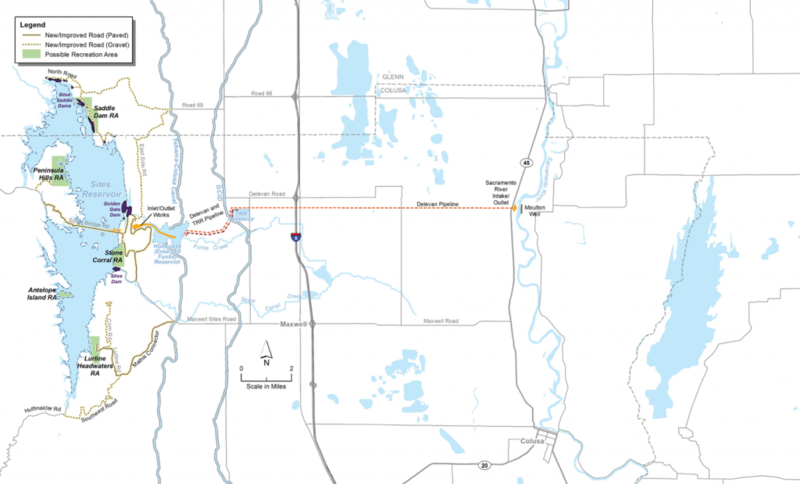 At the follow-up Delta Independent Science Board workshop in December, Dr. Lund, chairman of the Science Board, discussed the major findings of the report, the first being that connecting flows and fishes is central to achieving the state’s coequal goals. “The modern Delta is not a native ecosystem but is dominated by non-native species with some natives, and that’s a particular challenge for some of the ecosystem goals for the Delta,” he said. “Statistical analyses show that flows do affect fish, but decisions need a little bit more causal understanding of how flows involve fishes, especially as we try to manage the Delta and make some larger changes over time. Where larger changes occur in the Delta that we have to respond to, we need a more causal understanding of how these relationships work.”3 In my experience, when correlations that support science theory continue becoming more statistically significant with each added year of data, it is time to accept the theories and start doing something. Using the same excuses for inaction and continuing to promote more science will not save the Bay-Delta ecosystem. What has been missing for decades is this: our locally grown fisheries scientists have no access to what are often called the “knobs” of management in the Delta. Instead of scientists, resource agency managers and water purveyors constrict the range of adaptation to protect water supply at the expense of fishes and their habitats. Adaptive management is driven by managers. Our Smelt and Salmon Working Groups are stymied by senior management and by political oversight and control. Adaptive management in the Delta has become a synonym for how far fisheries agency managers will agree to weaken resource protection. Examples include weakening water quality standards in droughts; allowing unrestricted water transfers through the Delta; and closing the Delta Cross Channel gates in summer. It is time to listen to our home-grown fish scientists and let them turn the knobs in the right direction.